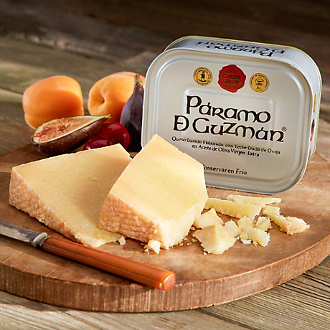 Páramo de Guzmán is an exquisite delicacy, capturing the imaginations of chefs and cheese fanatics across the world. Fresh raw milk from free-ranging Churra sheep is transformed into a beautifully aged cheese. Each wedge crumbles under the knife and each bite releases a story of the wild countryside and ancient traditions of Castille. This very special Páramo de Guzmán cheese has subtle aromas of rosemary, thyme and sage, the aromatic plants that fill the pastures of the Castillan meseta. This cheese was featured in the New York Times bestselling book 'The Telling Room: A Tale of Love, Betrayal, Revenge, and the World's Greatest Piece of Cheese.' This true story tells of Ambrosio, who resurrects the great cheese-making traditions of his town. He creates a sublime cheese and finds success, only to be betrayed by his best friend who takes over the company. It is a fascinating tale of the soul of Castille, and the role that great food plays in the life of Spain. Even with that touch of betrayal, this is a magnificent cheese! The current cheese masters at Paramo de Guzman still follow the handcrafted production methods of Old Castille, married with modern quality requirements. After aging for about a year, wedges of cheese are submerged in extra virgin olive oil and sealed in the signature white can of Paramo de Guzman. The longer it rests in olive oil, the more tender and flavorful the cheese becomes. Serve your Paramo de Guzman cheese at room temperature, with a bold glass of red wine and a slice of tangy membrillo or fresh fruit.